PROPEL Oil Management produces cost savings of up to 75%, can be completed on-site with no downtime required and prevents waste oil. PROPEL Oil Management produces clean and dry lubricant that is as good as new or higher specification. Hydraulic oil, turbine oil, compressor oil and gear oil are all suitable for cleaning. To see what is possible with PROPEL Oil Management review our case studies. Through the staged process, condition monitoring reports the lubricants remaining useful life, filtration and dehydration removes lubricant contaminants and additive replacement renews the oil to as good as new specification or higher. Utilising world’s best practice long proven in North American markets, CTG offers PROPEL Oil Management to its customers in Australia. Central to CTG’s offering is the lubricant condition monitoring that is used to report a lubricants remaining useful life (referred to as % RUL), water contamination, oil cleanliness / particle contamination and final lubricant certification. Lubricant condition is monitored using instruments that are designed to provide accurate, fast and reliable results governed by official ASTM testing standards (ASTM 6810 and ASTM 6971). The PROPEL Oil Management Advantage is that it measures how good the oil still is, not how bad the oil has become. Equipment degradation and damage occurs when contaminated and/or degraded lubricant is in-service. By monitoring the active antioxidants, CTG will detect in advance the level of additive depletion and logically avoid oxidation, acid formation, thickening and varnishing in the lubricant. 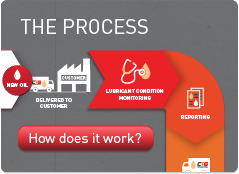 CTG monitors and reports all results to customers to ensure they are fully informed throughout the lubricant in-service lifecycle. Therefore lubricant maintenance intervals are well planned in advance and abnormal operating conditions are normally identified before lubricant or mechanical breakdown occurs. Based on the oil test results, clear limits are set for minimum remaining active antioxidant additive content and maximum water and particle contamination alarms can be established. All tested equipment approaching critical oil condition are identified. Using lubricant while it still provides machine protection makes sense, PROPEL Oil Management accurately predicts the remaining useful life of lubricants which allows customers to get the maximum usage from their lubricants, ensuring renewal is undertaken at the correct time and detect any abnormal equipment operation to minimise equipment downtime costs.